26.2 miles. 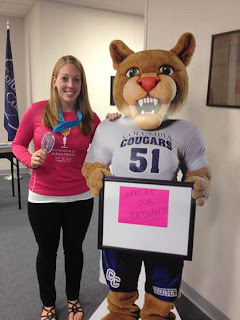 A feat that a Columbia College academic advisor, Bethany Daniluk, accomplished in the Wine Glass Marathon the weekend of Sept. 29. The 31st annual Wineglass Marathon, presented by Arnot Health Human Motion Institute, is a point-to-point course from Bath to Corning, NY. It is a fast and fairly flat course with an overall net elevation drop of about 250'. 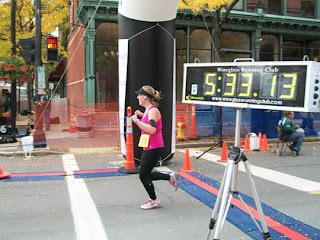 The course runs through several small towns and along scenic country roads. 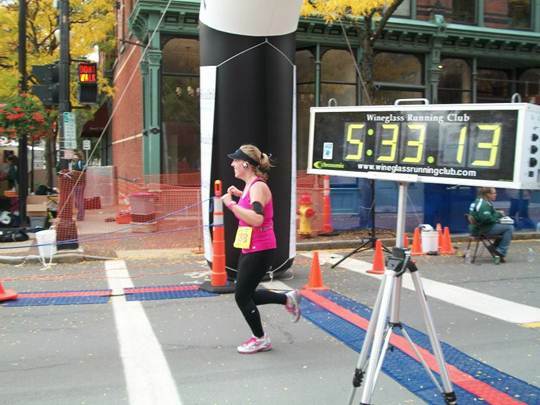 Finish is on Historic Market St in downtown Corning. Daniluk crosses the finish line. Scooter makes sure to congratulate Bethany.